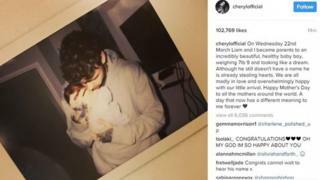 Former X Factor judge Cheryl has announced the birth of her first child with One Direction star Liam Payne. The 33-year-old singer said the baby, born on Wednesday weighing 7lb 9, was "an incredibly beautiful, healthy baby boy" and was "looking like a dream". She said they had not named him yet, but he was "already stealing hearts". "We are all madly in love and overwhelmingly happy with out little arrival," she wrote on Instagram beside a picture of Liam cradling the newborn. She went on to wish all the mothers around the world a Happy Mother's Day, saying the day would now have "a different meaning to her forever". In a message on his own Instagram page, Liam, 23, said he was "incredibly happy to welcome our new baby boy into the world". "It's a moment that I will never forget for the rest of my life and my favourite memory I have so far." He also said he was "completely in awe" of Cheryl and how she had been "the whole way through this", saying "she's really made my dreams come true". Cheryl's former Girls Aloud bandmate Nadine Coyle tweeted: "I am so so happy for you and your precious little boy & family!" Last year Cheryl, who has been married twice, said she wanted to be known just by her first name.